One of my favourite sites is on Lake Annecy near the village of St Jorioz. It is called Camping Univers and, just to set the scene, it has a solar system logo on an old and tatty sign. From the start we christened this Camping Paradiso, for those of you who have ever watched Bottom you will understand why. The campsite is a field with a part dilapidated brick shed type building in the middle, these are the toilets. The toilets are clean but come complete with cobwebs and spiders, they reminded me of my great-grans outside loo which was only to be used when absolutely desperate in case the monster spider in the corner decided he was hungry and you looked edible. Fortunately, having read Charlottes’ Web, I am now completely free of any spider phobia but I do have a phobia of dead birds, if anyone knows of a good book which may cure my phobia please let me know. Electric hook-up is available and can be shackle up from the owners on site cabin, therefore you have to camp near the cabin if you want to charge the laptop. Despite it’s obvious short comings regarding health and safety I absolutely adore this site, it is unpretentious in the extreme yet almost a stones throw from the shores of the beautiful Lake Annecy. The cycle track is within spitting distance and the village is a ten minute walk away with its totally tempting patisserie for the odd million calorie cake or tart (promise yourself you will cycle around the lake and you can eat your treat guilt free and then, like me, you can forget all about your promise and go back to camp for a snooze)) Considering it’s so convenient for all Lake Annecy has to offer, it feels a million miles away from the hustle and bustle of the more touristy sites and places of interest. If you want the next best thing to wild camping on the shores of the Lake, then Camping Univers is for you, if you don’t like spiders in your shower it might be a good idea to stay else where. The picture of the campsite (right) says it all, a very special place. In France you don’t have to drive far from the channel ports (4 – 5 hours) to find a huge lake and it’s smaller companions in the Parc Natural de la Foret Orient. I’m not mad keen of forests, they’re just a bit too foresty for me, but the dense fir forest is interspersed with wide open spaces and of course the lakes. 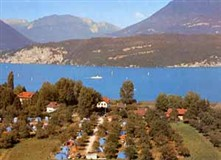 Most people head for the 4 star Camping Lac D’Orient (www.camping-lacdorient.com) on the shores of the biggest lake Orient. But for those who don’t need the all singing and dancing type site then you might like to follow in our footsteps and try Camping L’Epines Aux Moines (http://www.pnr-foret-orient.fr/fr/pdf/oti/camping/lepine_aux_moines.pdf) on the shores of Anse Du Petit Orient. The campsite has shaded pitches and clean toilets (no man-eating spiders here), it also has a play area and from memory a small shop. The location is excellent, just a few metres from a lake beach which also hires out pedalos with slides off the back. We had an excellent time on the lake diving and sliding in off the pedalos. There are sailing schools nearby, Troyes is just up the road and it is excellent cycling country. 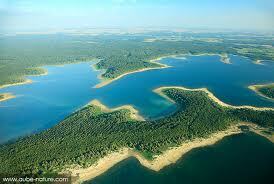 We were originally using it as an overnight stop but ended up staying 2 nights so we could mess about on the lake. On our first night an elderly couple emerged from their caravan in long trousers and tops, sat in their deck chairs and faced our pitch, as if they were waiting for the entertainment. It was very hot and I just thought them a bit odd, little did I know what was to come. About 10 minutes later we realised why the elderly couple were dressed from head to toe: mosquitos! Before we had a chance to find the swatter and light our anti-mosquito candle the little blood sucking buggers were having a lovely evening meal -us! The couple looked on amused as we retreated to the motorhome, shutting the fly-nets and muttering obscenities. It didn’t put us off staying another night, we just did as the elderly couple did and covered ourselves from head to toe. You have been warned but this is still a pretty cool campsite in a beautiful area. Part 3 – The Med………to be continued. This entry was posted in Adventure, Camp Sites, Camping, camping france, cool camping, Family, France, French Alps and tagged Camping, camping l'epines aux moines, Charlottes Web, lac d'orient, Lake Annecy, mosquitos, pedalos, Saint Jorioz. Bookmark the permalink.